Having stopped here in the past for coffee and cake while out riding, staying over at Martinborough meant the perfect opportunity to experience Medici’s full brunch offerings. We arrived around 9am at the beginning of the day (Sunday), so were met and seated easily. And enjoyed the ambience peacefully before the 10am rush. Named after the Italian royal house and banking dynasty of Medici (who knew they developed the double entry book-keeping system? ), the cafe gives a nod to its history with Sistine chapel-style paintings on the ceiling, rustic wrought iron chandeliers and an old Medici head (coin?) in the logo. Local art on the walls is for sale, there is a (usually) sunny courtyard out the back, the coffee is by Mojo, and there is a mix of both counter and menu food on offer. 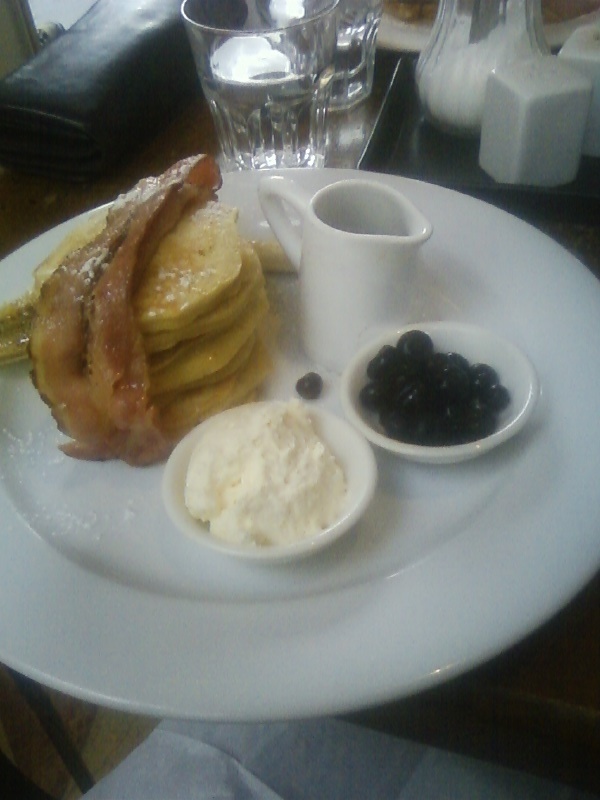 French toast and pancakes were the order of the day. Both with banana, bacon and maple syrup. The french toast was rated as pretty good with a pleasing balance between the salty crispy bacon, and creamy egginess of the toast. And the pancakes (which were really small pikelets) were presented appealingly in a stack with accompanying condiments in separate dishes and jug. Good for those who like to mix and match flavours to personal taste. Like me. One coffee was missed off the order, and the wait staff seemed a little more focused on what they had to get through rather than engaging with the customers, so perhaps some room for improvement on that front. But otherwise good food and coffee, in a cafe with character, in a delightful corner of the greater Wellington region. It will remain a regular ride stop.